What a cutie! A bird with attitude. 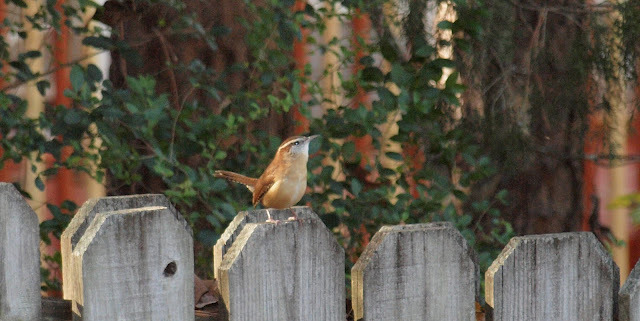 I'm still hoping to get my first sighting of a Carolina Wren. A couple of really great pics. I found your blog today on OBN. I like it and will "follow" along. Aren't they just so cute! I had one show up at my feeders in MA for aobut 2 days, then it was gone. I also saw one at the bog when I first got here but have not seen one there since. Perhaps they will be back in the spring! Congrats on another lifer! Haha! I know what you mean about how loud they are. I love these little fellows in the winter. I can hear them anywhere in the house...with the windows all closed and the furnace going. They bring a lot of cheer with them. Lovely photos!